Cyclic Field Operation or CFO designation applies to IF tires. Per the Tire and Rim Association, the cyclic service is intended for use on a vehicle with a minimal requirement for torque transmission and with appreciable total weight fluctuations, like those on grain carts, combine and air seeders which are repeatedly filled up and emptied. Maximum loads cannot be carried for more than a mile at a time at designated speeds. CFO allows the IF an increased load capacity of 55% when operating under 10 mph and a 30% when operating 11-20 mph. The benefit for growers is that if the IF tire is properly inflated it will be operating at a 20% lower inflation pressure compared to its standard tire counterpart which equates to larger footprint and less ground bearing pressure which means less compaction and ultimately higher yields if the conditions are right. Standard non IF have a similar Cyclic Loading that they abide by. The definition of cyclic loading is the same, however a standard radial tire operating in a cyclic application may carry 55% more under 10 mph and 70% more under 6 mph with a 25% increase in inflation pressure with a minimum increase of 6 psi and a maximum of 12 psi. As you can see from this example, there is a 12 psi difference in operating pressures in a cyclic application which would equate to a larger footprint and less ground bearing pressure. However, one downside to IF in a cyclic application is the 15% loss of additional load capacity under 6mph on tires with identical load indexes, which to some growers may be more important to them than the lower inflation pressure. Bottom line is I would suggest that growers understand exactly what that piece of equipment weighs no matter what tire they have on it and set the inflation pressure appropriately to ensure they are running with the largest footprint possible to minimize compaction. The Cyclical Field Operation designation has been utilized for tire inflation recommendations on combines & grain carts where load is accumulated and dispersed during harvesting operations. The CFO pressure recommendations allow for increased load carrying capacity due to the duration of maximum loads. In recent years there have been advancements in tire technology with the development of “IF” or increased flexion and “VF” or very high flexion tires. This technology allows a tire to carry about 20% (IF) or 40% (VF) more load at the same inflation pressures as the conventional radial tires or the same load with a respective reduction in inflation pressures as well as having the increased load carrying capacity during cyclic field operations (CFO) during the harvesting process. Choosing an “IF” or “VF” – “CFO” designated tire would be appropriate when load carrying capacities of standard radial or bias tires are not adequate to carry the maximum loads for combines & grain carts during the harvesting process. This option should also be considered when your harvest season involves wet or muddy field conditions. With increased footprints and additional flotation provided by these tires, growers can increase harvesting opportunities during adverse conditions and may be the difference between harvesting or just salvaging what’s left of your crop. Growers may benefit from reduced ground pressures and compaction but that will depend on many factors including soil moisture, climate and production system among others. Reducing soil compaction contributes to maximizing production and should always be evaluated in every grower’s operation. Radial tires that are marked with CFO after the tire size, are IF or VF marked radial tires that are approved to be used on agricultural equipment that experience a significant change in axle load while operating in the field. CFO stands for Cyclic Field Operation and agricultural equipment that would operate under these conditions are combines, grain carts, and air seeders. In cyclic operations, the axle load increase and decreases when harvesting or planting crops. This additional load is carried at low speeds in the field are not carried on the road. Before the introduction of IF and VF marked radial tire, bias and standard radial tires had been used on equipment with cyclic loading conditions, but the tires didn’t require any extra identification. The standard developed by The Tire and Rim Association approved cyclic loads with + 6PSI for Field Service Maximum Cyclic Load. The standards allowed extra loading on bias and standard radial tires based on the application and travel speed of the equipment. When the tire industry introduced the IF and VF marked radial tires, the standards did not allow extra loading based on reduced speed or application. When farmers started to see the benefits of the IF and VF tires on their tractors, they requested to use the IF and VF marked radial tires on their combines and grain carts. To address the requests, the tire industry introduced the CFO standard for the IF and VF marked radial tires. 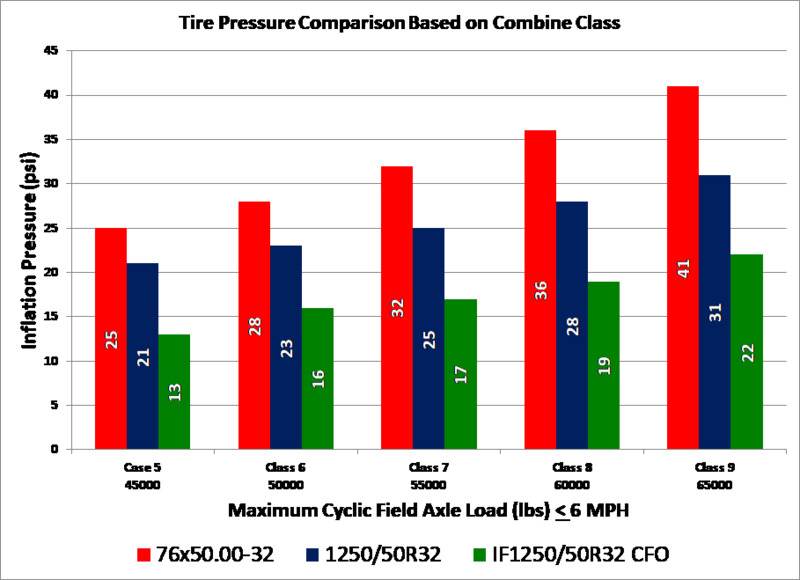 An IF/CFO marked radial tire will still carry 20% more load then a standard radial tire for road transport, but in cyclic service it will carry and additional 55% more load without increasing the inflation pressure. For farmers concerned about soil compaction during harvest, the higher load capacities of the IF/CFO tires require less inflation pressure. To make this easier to visualize, Chart 1 shows the inflation pressure required for a flotation tire used on a combine. The chart compares similarly sized bias, standard radial and IF/CFO radial tires. The axle load for each class of combine is an approximate maximum cyclic weight for the machine. This is just a general comparison, please consult your operator’s manual for axle loads to determine the inflation pressure required on your combine. In the chart, a class 8 combine has a cyclic axle weight of 60,000 lbs. To be able to carry the load, a 76×50.00-32 bias tire requires 36 psi, a 1250/50R32 standard radial requires 28 psi, and the IF 1250/50R32 CFO radial requires 19 psi. If a farmer is trying to limit ground compaction, they would want the IF/CFO tire on the combine. The major benefit of using CFO tires on harvest and seeding equipment is being able to carry the axle load at lower inflation pressures compared to the same sized standard radial or bias. The lower inflation pressure help reduce soil compaction in wet conditions. The IF/CFO tires will also have a larger footprint vs a standard radial, helping increase flotation during a wet harvest. On larger grain carts, the IF/CFO tires may have enough load capacity allowing customers to still use one axle instead of multiple axles or tracks and control equipment cost. The CFO marked tires are just another tool customer’s have to help minimize soil compaction as the equipment gets larger. Cyclical Field Operation, or CFO, is a 55% load bonus given to specially designed and constructed IF tires while that tire is being used in a “cyclical” condition and operating at or below 10 mph. “Cyclical” means that the load applied on the tire is in constant flux during the normal operation of the machine on which the tires are fitted; the tires are engineered and built to handle the fluctuating load, including its peaks. The perfect and purest example of this application is a combine during harvest. Consider the combine moving through a soybean field. The combine is moving at 6 mph and is using its header to harvest beans. The harvested beans move into the feeder house, through the separator and then are deposited into the grain bin of the machine. At the same time, the combine is actively transferring the harvested beans from the on-board grain bin into a grain cart that is following closely beside. During this time, the weight of the soybeans is a live load—their weight is flowing through the combine and then out to the grain cart, shifting from tire to tire. Ultimately, their weight is never constantly being applied to the tires. A “live,” fluctuating load—like grain at harvest or a spray tank during application—is the only type of load that can take advantage of the CFO tire’s load bonus. CFO tires are exceptionally strong, but they are NOT designed for sustained extra-high loads. This ability to handle massive spikes in load is a must-have for today’s harvesters. These machines have seen a more significant increase in weight than most other pieces of equipment over the last several years. The introduction of VF CFO technology has allowed equipment manufacturers to offer pneumatic solutions for harvesters that carry the load while putting minimum amounts of pressure on the soil. Minimizing soil compaction is increasingly important. The front axle of a loaded combine can weigh as much as a properly ballasted four-wheel drive tractor. It would be perfectly possible to carry the loads required by today’s combines with a standard radial tire. However, the air pressures needed to do this job would be incredibly high. A good rule of thumb is that for every psi in the tire, the machine exerts roughly 1.1x that pressure as compaction force into the soil. For example, farmers can buy a 800/70R38 tire with very high load capacity. But until the advent of VF CFO technology, the only way for a tire that size to carry the load of one of today’s massive combines, filled, was to operate at around 50 psi. That creates a very hard ride and, even more important, means the tires would be pushing down on the soil with a force of about 55 psi. That’s enough force, in many conditions, to create a deep compaction zone that would restrict root growth, water infiltration and air supply. In short, VF CFO requires 40% less air pressure to carry standard load, and 50% less air pressure to achieve above cyclical load bonuses. At Alliance, we believe that every modern harvester—and large self-propelled application equipment—needs at least an IF CFO tire and preferably a VF CFO. The loads are simply too high and the cost of compaction is too severe. To show our commitment in improving the situation, we are expanding our Agriflex Technology product line for harvesters to include VF CFO technology in as many sizes as the market requires. Not all tires are used for the same operation and for that reason additional features have been added to several tire sizes to be more efficient and adaptable to a specific performance need. One specific kind of tire “enhancement” is the Cyclical capability. This kind of concept applies mainly, but not limited to, combines and grain carts where the load on the tires changes during field operation. During harvest the combine unit (combine plus header and any additional accessories) starts in the field with a specific weight (combine unit weight plus fuel) that is the lowest weight on the field of the combine unit. When the combine unit begins harvesting, the grain is collected in the grain bin, increasing the total weight of the combine unit until reaching a maximum weight when the grain bin is full. The combine unit returns to its lowest weight as soon as the grain bin is emptied and the cycle starts again. This is the concept of cyclic – increasing and decreasing weight. In a normal operation, a tire generates a certain amount of heat due to the internal rubber friction. This is considered during development of the tire. If the tire is overloaded with more than it is designed to handle, the tire’s temperature will rise and create internal damage to the tire, accelerate wear and potentially separate the tread. A tire designed for cyclical operation takes into account this increase in heat and is reinforced internally to withstand this “temporary” overload. A tire designed as cyclical will be marked on the sidewall the denomination of CHO (Cyclic Harvest Operation) when it is a conventional tire and CFO (Cyclic Field Operation) if its applied to an IF or VF technology tire. On a conventional tire, considering the same inflation pressure, the load capacity increases when the working speed is reduced. On a CHO designed tire, the temporary overload permitted is 65% at 9 mph or 80% at 6 mph based on the load capacity at the tire rated speed. For example, the load capacity of an 800/70R38 CHO 178D at 35 PSI is 16.530 lbs. (178) and 40 mph (D). The cyclic overload allows to this tire to resist – at 35 PSI – 27.280 lbs. at 9 mph or 29.760 lbs. at 6 mph. In comparison, a non-CHO version of the same tire would hold only 23.150 lbs. at 6 mph with no air pressure increase. At equivalent 35 psi, above CHO Cyclical Harvest Operation tire enables 80% Cyclic Load Bonus at 6 mph, whereas Standard Tire enables 40% Load Bonus at 6 mph. A big difference! The same temporary overload concept is applied on IF and VF tires. These tires are designed to withstand higher loads with the overload bonuses lower than on conventional tires. On an IF CFO tire the overload bonus is reduced to 55% and to 33% on a VF CFO tire. This is considering the same inflation pressure and using the same base load capacity at the rated speed and inflation pressure. What does this mean to the end user? The tires are stronger and heavier but the main advantage is the possibility to reduce inflation pressure with a larger footprint and less soil compaction. When considering what inflation pressure to use, we must know the maximum load the tire can carry at a certain speed. As an example, (all approximate and rounded values) a Class 7 combine with a 12 row corn head would have a total empty weight of 48.000 lbs. and 66.000 lbs. when the 300-bushel grain bin is full of soybeans. Considering that the front wheel supports 75% of that load, each tire would need to hold 18.000 lbs. (48.000 lbs. * 0.75 /2 tires) when empty and 25.000 lbs. (66.000 lbs. * 0.75/2 tires) when the grain bin is full. When checking the tire inflation tables for this specific tire size, and choosing 6 mph as a normal working speed during harvest, the non-CHO tire would need an inflation pressure of 29 PSI to hold the 25.000 lbs. when full. The CHO tire, thanks to the cyclical bonus, would only need 23 PSI to hold the same 25.000 lbs. when full. This means that the CHO version needs 6 PSI less inflation pressure. Less inflation pressure means larger footprint, reduced soil compaction, better crop development and higher yields. A win-win situation. Cyclical Field Operation (CFO) tires are specifically designed for use on combines, cotton pickers, and grain carts, where varying loads and reduced soil compaction is important to increasing productivity. The IF/CFO design allows for an increase in load carrying capacity, while not having to increase the air pressure. These tires are designed to carry more weight than the same size conventional radial tires and are constructed to withstand the extreme load changes that exist during harvesting. Since load weights are constantly changing- empty to full to empty again- the tires are given a 55% cyclic load bonus at 0-10 mph without having to increase the air pressure. One benefit is that the IF/CFO rated tire can reduce ground bearing pressure and soil compaction, since it carries 20% more weight than the standard tire at the same air pressure. Another feature is that the air pressure can be reduced to carry the same weight as a standard tire, which also reduces soil compaction. Reduced soil compaction in the field equates to higher yields year over year. In addition, CFO tires can harvest larger quantities with less stoppage time, therefore increasing the farmers’ productivity. In some applications such as with grain carts, the IF/CFO tires are needed to carry the heavy axle loads. Remember that correct air pressure for the load is important when soil compaction is an issue. Cyclical Field Operation (CFO) rated tires are designed with technology that allow higher carrying capacity without increasing air pressure during field work and typically found on harvest machinery and grain carts. Harvesters today are heavier than they have ever been. It is becoming more common to see hopper extensions, larger and folding corn heads, 18 row corn heads, etc. These machines are asking more than our standard tires can offer. Therefore, growers need to consider fitting their machines with CFO tires. Not only does a grower gain the additional carrying capacity without increasing air pressure, but he/she will also see an increase in productivity due to traction and flotation in damp soils and significantly lower soil compaction. As a byproduct, they should also see an increase in yield. It is also important to note performance difference between IF CFO & VF CFO tires. In the summer of 2016, Michelin participated in the Ag PhD show in Baltic, SD at the Hefty Brothers farm. A soil compaction pit was produced to show the reduction in shallow and deep compaction as well as the overall rutting of the VF CFO tire compared to IF CFO harvest tire of the same size. Using Hefty’s Case 9120 combine with a Capella folding 12 row head and a full hopper (approximately 350 bushel of corn), one side of the machine was mounted with Michelin VF CFO and the other side with IF CFO tires. The combine was weighed and showed 61,350 pounds in this configuration when fully loaded, air pressures were set in accordance with load indexes, and then the combine, in this configuration, was driven on and off the soil compaction pit. Once we fully revealed the layers of the pit and did the analysis, the results were striking. Our VF CFO tire was able to run at 24psi vs IF CFO tire at 36psi (50% air pressure increase required for IF CFO). We showed a nearly 6% larger footprint when looking at square inches of tire on the ground. Finally, we reduced rutting in the same soil by 20%. Bottom line, CFO rated tires are a great fit for almost all harvesting situations. However, not all CFO tires are the same. I recommend end users do their research. Understand the difference between IF, VF, IF CFO, VF CFO and variance in load indexes. Any gain in yield goes to your bottom line.